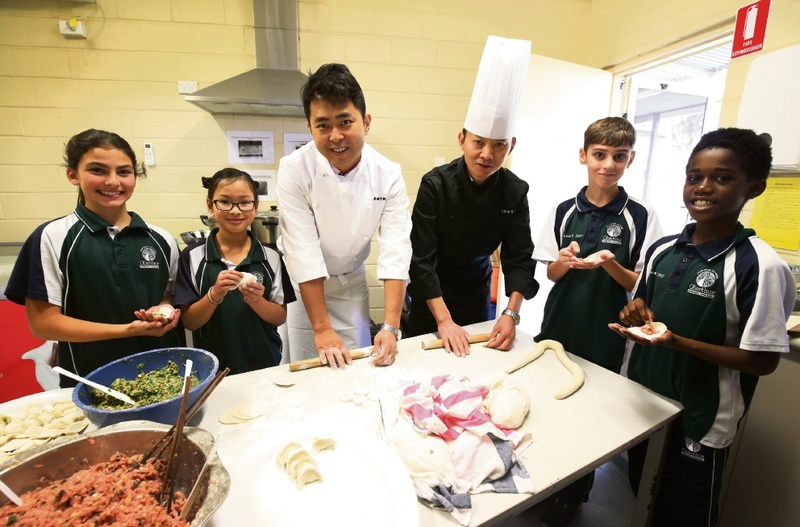 SICHUAN cuisine by two winning Chinese Masterchefs provided a taste sensation for all 640 Oberthur Primary School students plus staff at a Chinese Arts and Cultural incursion day on Monday. The school was abuzz with activities run by a visiting group of 13 from Chengdu, affectionately known as the home of the giant panda. Chengdu’s Panda Base helps boost panda breedings and Chengdu City is one of the sister cities of the City of Perth. Students learned calligraphy, painted images of pandas, practised hand-shadow puppetry, and took part in Chinese dance. The kitchen was filled with parent helpers to assist the Chinese Masterchefs fold and steam or boil hundreds of dumplings. The incursion culminated with a showcase in the afternoon attended by Opposition leader and Riverton MLA Mike Nahan. Oberthur Primary School has five Chinese-speaking teachers and a Languages Other Than English teacher who provide 6.5 hour of the weekly curriculum in Chinese up to Year 4. A group of girls at the school take part in Chinese dance and the school has visited China every second year since 2004.